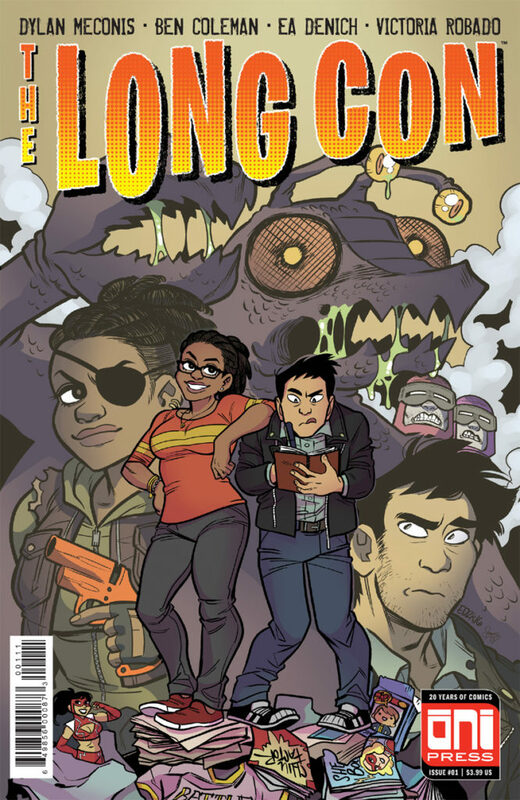 THE LONG CON: coming in July from Oni Press! Exciting news! My next publishing project, The Long Con, will be serialized starting this July from Oni Press! This is my first book to be published the old-fashioned comic book way – in individual issues with cool covers, available at your local comic book store, and then in trade collection (…if enough people like it!). Comic Book Resources ran an excellent piece on it yesterday along with a four-page preview from Issue #1. Read it here! The Long Con has a very simple premise: the Apocalypse hits during a Comic-Con. Most of society, and everything within a fifty mile radius of the convention center, is reduced to glowing rubble. Five years later, a desperate journalist braves the wasteland to revisit the site, and discovers that the con never ended…it only evolved. This is also an exciting first for me in some other ways. I’m co-writing the book with my friend and regular Twitter bantering mate, Ben Coleman. Ben is a deeply funny comedy writer who, thanks to his career as a film critic for the Portland Mercury, also has great discernment when it comes to smart storytelling. We’re also working with an incredible artist, Emilee Denich, because we were lucky enough to catch her in the thirty seconds before she becomes insultingly famous. Finding an artist who can design dozens of character AND draw big ridiculous set-pieces AND crowded fight scenes AND physical humor AND character banter AND mimic different media styles AND do it in an overall style that would appeal to a broad audience AND make deadlines? That is the dream, my friends, and Em is so freakin’ dreamy. Add in the color stylings of M. Victoria Robado, the type wizardry of letterer Aditya Bidikar and the laser-eyed editorial skills of Ari Yarwood and Robin Herrera and you have the recipe for an amazing comic shop debut. I hope you’ll all join us when issue #1 arrives at your local comic book store this summer!